Certain indulgences seem ubiquitous, nearly a genre of consumer product name brands in their own right, such as Harley Davidson or Rolex. Among these is McIntosh Labs, a company that has been producing high-end audio electronics and speakers for more than half a century. I recall as a child occasionally having the pleasure of being taken to a mall, in which stood possibly the city’s only high-end audio store in the 1970’s, same place where Flanner and Hafsoos was located. I recall seeing outrageous components priced sky high, with names like Teac, Nakamichi, and of course, McIntosh. The store had an elitist atmosphere, and only those with a true passion for audio spent money there. The last time I visited, I saw much affinity to high-end yet without high-end components. 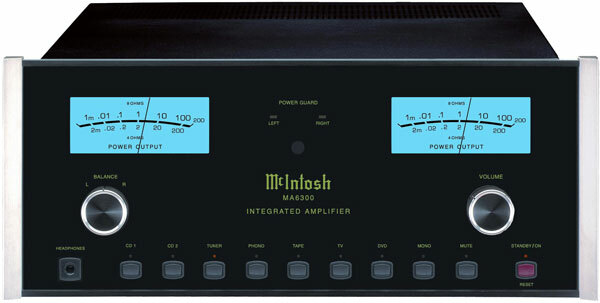 When I was sent the McIntosh MA6300 integrated for review, I couldn’t help but wonder what’s become of McIntosh? 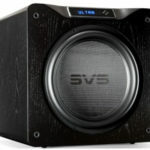 Over the 25 years since two channel audio was king, has the company caved, or are they still making state-of-the-art equipment? One of the factors involved in my assessment is the acquisition of McIntosh Lab by D&M Holdings, the group that also owns Denon and Marantz. It makes me wonder about the long term viability of McIntosh’s “cost no object” approach to Hi Fi when the ownership is a conglomerate with a largely mid-fi concerns. How many times have audio enthusiasts seen the detrimental effect that corporate ownership of a private company can have as principles give way to penny pinching for profits? My answer came from the fact that an “R-Core” transformer is used. Essentially, this is a newer-generation transformer which is 40% smaller than normal EI transformers. This design has lower temperature emission and extremely low noise. In addition, custom high-tech “Thermo-Track” output transistors with high efficiency heat sinks contribute to a clean sound with minimal heat emission. When the parts are added up, a clean design with newer technology yields less bulk and heat. Both are very welcome, especially to a fan club of individuals who have been faithful to McIntosh for years. It means adding the MC6300 to a second system, or upgrading to a Mac for the first time won’t be a budget breaker, or a back breaker. In some ways the McIntosh ethos is timeless, one might even say entrenched. While recently unveiling the MS750 Music Server (see this month’s upcoming Spotlight article, McIntosh 2008 at House of Music. –Ed), products like the MA6300 still incorporate traditional functions, such as tuner and tape inputs. Month by month, an increasing number of audiophiles are turning to internet and hard drive-based music, and they’re not going to be using a Tuner or Tape input. My guess is that this is an “accommodation” move to appease long-term customers. It’s likely that a good number of more traditional audiophiles will still own McIntosh gear and the company does not want to alienate them by excluding the functionality. Naturally, the long-term success, and legendary longevity, of McIntosh has also worked to make it sensible for them to include these functions. I wonder what kind of riot would ensue among McIntosh fans if the company would offer a breakout series with more forward directed functionality and, say, two buttons only on the front? One thing that I’m fairly sure will never change is the McIntosh aesthetic. Having a winning look mating early electronic needle meters to contemporary LED lighting, the look of a McIntosh doesn’t have to change. It’s a classic, timeless design in beauty, and the huge blue meters are tremendously fun to watch! I find myself sitting in a trance staring at them for minutes at a time. We’re in an age when there’s nothing to look at, nothing to do with digital audio (nothing, that is, unless you are involved with internet music services through a computer). Vinyl lovers can clean the album and stare at the LP as it turns hypnotically – that’s their mindless trance. What mindless trance do CD owners have? The blue meters give me something to do, to analyze as if there is some importance to the pattern they are stitching together. This is where the sentiment of the meters takes over from their necessity. 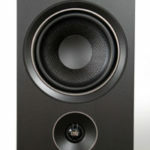 The theory is that they are reflective of the number of watts being used, so that an overload of speakers can be avoided. However, they are not predictive of the level, but merely reflective of it. Without a signal coursing through the unit, they cannot indicate the volume level. 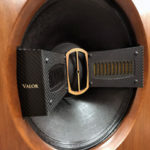 The only physical indicator of the amp’s level being a vaguely defined notch in the chrome trim on volume control, it could be easy for a person to mismatch level setting to listening material – and get a surprise! There could be times when the volume level could vary significantly between sources or selections and have the listener caught off guard. A simple method of returning the volume to lower levels solves this. But, if one forgets, the pretty blue indicators will surely remind! With all the protective devices installed on the McIntosh via the Power Assurance System, it would take truly irresponsible treatment of speakers to fry them using this amp, meters or no. The meters strike me more as nerve-soothing devices, and I readily admit they work wonders for the soul! The meters bring back so many good memories for me – my father’s Heathkit stereo, and some of my early rigs which had EQ’s flashing green, yellow and red LED’s (Something to put me into a trance!). Above the bright, green logo on the face are the Power Guard indicators. I wouldn’t know whether they were ever activated or not, as I do not overdrive equipment. Let’s just conclude that if these indicators are flashing for you, you should interpret them as “Hearing Loss” indicators! I will assume they work flawlessly, since in conversation with McIntosh, I learned that the company has in place the ultimate quality control system – in the form of this elderly lady who has been at the end of the assembly line for decades. She is fabled to have rejected an ungodly amount of product due to her hyper-critical standards. When you want to be known for quality, it’s good to have a stickler like her on your team. On the face of the MA6300 two controls sit below the meters, BALANCE on the left, and VOLUME on the right. The functions lining the bottom of the face are (from left to right) HEADPHONE jack, inputs CD1, CD2, TUNER, PHONO, TAPE, TV, DVD, MONO, MUTE, and STANDBY/ON. The silver aluminum framework contrasts attractively to the black-glass face. The thorough, very user-friendly Manual explains how to remove the four feet and cut out proper ventilation in a cabinet if mounting for a custom installation is desired. The rear of the unit is compactly presented for having so much room; grouped together are power controls and data ports necessary for integrating other McIntosh equipment into a remote-controlled system. Custom McIntosh gold jumpers are used for the Power Amp In and Main Out jacks. In addition to the aforementioned inputs, Tape Out is provided for recording. The CD1 inputs are balanced, while the CD2 are single-ended. The Phono section accepts moving-magnet cartridges. A ground and detachable IEC are provided. The speaker binding posts were grouped in a compact fashion, such that I found it crowded getting my fingers (I do not have large hands) (A dreadful case of wishful thinking, Doug. I know you are an avid basketball player. –Ed) into the space to connect the RCA interconnects to their single-ended connectors. I made it work, however those with thick fingers would likely find themselves removing the speaker cables from the posts in order to maneuver the IC’s (interconnects). Most owners will likely not be swapping IC’s with regularity, so this may be a moot point. This minor inconvenience, however, was offset by the wondrous gripping ability of the speaker binding posts. I have used many more robustly built posts on higher-end equipment without the cinching ability of these. It made hook up of cabling easier. Included is the lovely McIntosh system remote, another thing of beauty. This is one of the most pleasant system remotes I have encountered, with its rubberized protective shell and backlit, perfectly-sized and -spaced function buttons. The amp was responsive to all commands and ramped up level with proper pace so as to allow for fine graded adjustments to volume. Other manufacturers could take a lesson from McIntosh here! 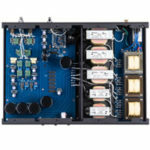 The proliferation of solid-state and tube integrated amplifiers is a wonderful development for the audiophile community in the U.S.. At one time, integrated’s were more a European thing, while the U.S. was largely the domain of receivers and separates. Now, it is commonplace to see them in systems of very high quality, and manufacturers almost seem in a rush to produce no-compromise integrated versions of their preamps and amps. sine wave continuous average power output. The output RMS voltage is 28.3V across 8 ohms. RMS voltage is 25.3V across 4 ohms. (55.9cm) including front panel and knobs.